A 50-55 gallon fish tank or aquarium kit is an ideal choice for hobbyists who want to keep a freshwater community or reef tank with many types of schooling fish. Many large cichlid fish also need at least a 50 gallon aquarium to thrive that makes this large sized tank is commonly chosen by many cichlid lovers. Such large sized tanks are also chosen for other large body fish such as Goldfish, Flowerhorns, Tiger fish, Arowanas, etc., and aquatic turtles. 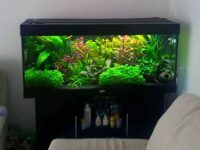 Others: thermometer, fish net, fish food, water conditioner, plastic plants, setup and care guides. 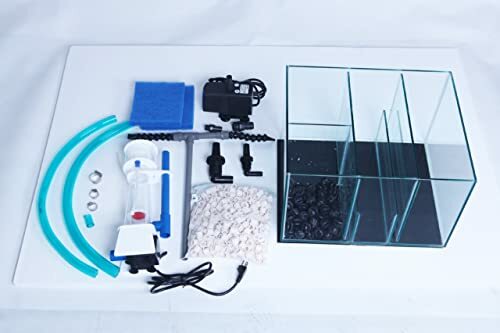 This is one of the best glass aquarium kits for beginners because of its very affordable price and quality components. It is an all-in-one kit for starting a tropical aquarium. 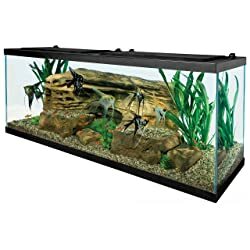 It comes complete with most essential accessories including hoods with LED lighting, a filter, heater, thermometer, fish net, fish food, water conditioner, some decorations, and guides. The main tank is built for strength and durability. It is perfectly covered by two 24-inch hoods that creates a sleek appearance. There are pre-drilled holes on the hoods for placing aquarium equipment. The hinges make it easy to open and close the hoods. The LED lights attached under the hood provides bright daylight for the entire tank. The Tetra Whisper 60 power filter included in the kit features a maximum flow rate of 330 gallons per hour that is strong enough to keep tanks up to 60 gallons clean and clear. You can easily adjust the flow rate of the filter with a flow control dial on its top. It is very helpful for you to lower the flow rate during the feeding time of your fish to keep food particles out of the filter. The filter media this filter uses are Bio-foams and Whisper Bio-Bag cartridges. Whisper Bio-Bag cartridges are floss pads included with activated carbon for mechanical and chemical filtration while bio-foams are for biological filtration. 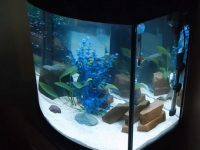 Because there are two positions on the hoods for placing two hang-on aquarium filters, you can use an extra filter for better filtration if you have numerous fish to care for. You will need to buy a suitable stand to place the tank on to. 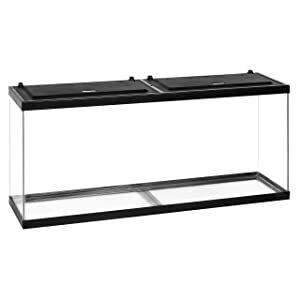 You should choose a 55 gallon aquarium stand that has a top surface a bit larger than your aquarium base 48″ L x 13″ W.
Used for: freshwater or saltwater setup. 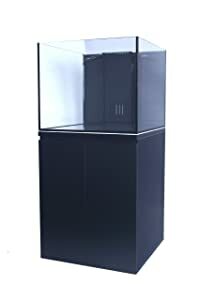 The best thing that makes this acrylic aquarium chosen from other options is its very seamless and clear acrylic view from the corners to the sides. There is absolutely zero visible tint or sealant on the aquarium, which boosts the lifelike aspect of the flora and fauna inside. Under the hood of this tank, there is a 24-inch light fixture, which is intended to use with a fluorescent bulb (not included). You can also use a 24-inch aquarium LED bulb if you want or replace the hood with a 36-inch LED light fixture. The acrylic top permits light to shine through very well. Setting a LED light fixture by this way helps to prevent the light from damages by the steam from the aquarium. The acrylic top of the tank features two pre-cut holes for placing a hang-on-back filter and a heater. You will need to buy separately a 50 gallon aquarium filter and 200-watt aquarium heater to set up the tank. You can build it as a fresh, brackish or salt water tank as you want because all of its manufacturing materials are entirely safe for these types of aquariums. Tubing: Durso Stand Pipe, Return T pipe, bulkheads, tubing. This is one of the best selling complete systems from SC Aquariums that is ready to plug and play. 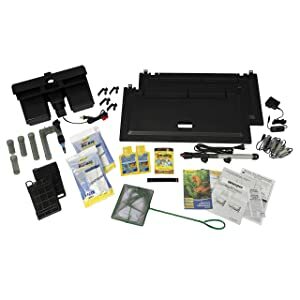 The package includes almost essential equipment for setting up a reef system such as a built-in overflow box, sump tank, protein skimmer, water pump, and tubing accessories. A stylish cabinet stand is also included in this combo making it a great choice for anyone who doesn’t want to drive around to find separate components. The stand is constructed of excellent quality manufactured wood for durability and long lifetime. It is built with a large open space inside the cabinet for you to place and conceal the sump filtration system. The best feature of this product is its glass thicker than other glass fish tanks in pet stores you can find. 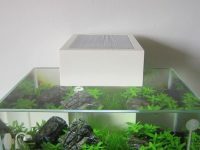 It is well constructed for both freshwater or marine setups. The only drawback is that it comes with no instructions for setting up an aquarium with a sump system. If you don’t have any experiences with this type of filtration system, the setup process may be difficult for you. On the other hand, if you have accustomed to the filtration system with an external sump tank, this complete package is the best option that saves you a lot of money buying separate equipment. Filtration: filter tray (box), pump, Bio ball, and air pump. 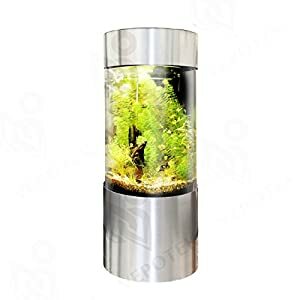 Being made of high quality acrylic, this cylinder tank looks very stylish, durable, and clear that provides a wonderful 360-degree view from any angles around it. It comes with a brushed stainless steel stand and canopy that are all cylinder shaped. 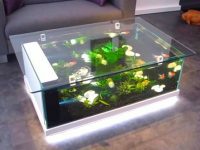 By this design, the tank takes less space to place than other rectangle aquariums making it ideal for corners near the sofa in your living room or office. 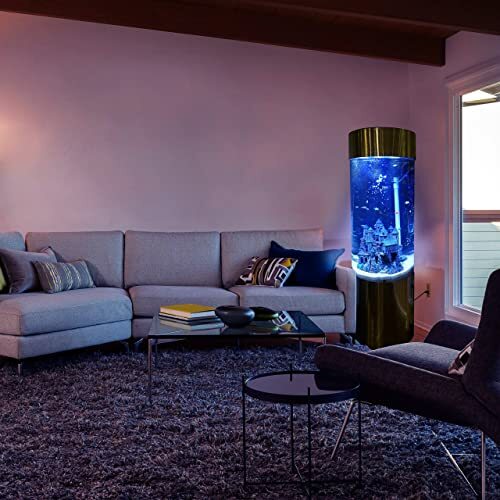 The filtration system of this aquarium may be strange for you that makes you think it is hard to set up. Actually, it is so easy to understand. The hood is designed to include the LED light and filter tray inside it. The pump pumps the aquarium water into the filter tray containing floss pads and bio-balls for filtration. This is everything about the mechanism of this filtration system. The filter box (tray) can accommodate a huge amount of filter media for the most efficient multi-stage filtration. Floss pads for mechanical filtration, bio-balls for biological, and you can also put a bag of activated carbon to the tray for chemical filtration. 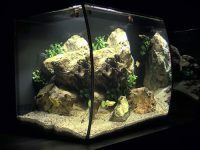 With the higher profile compared to other 55 gallon aquariums, the tank has smaller water surface for gas exchange that may limit the number of fish it can keep. 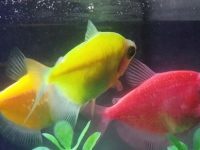 If keeping fish is the main purpose of yours, you should buy a traditional rectangle tank. I will choose this tank as decorative furniture rather than a house to keep fish. Others: samples of fish food and water care. 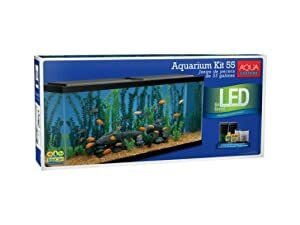 This aquarium kit comes as a complete kit make it ideal for beginners who want to get starting with their first large aquarium. You don’t need to care about finding an LED light and filter fit for the tank because all are included in the kit and you only need to set up them in proper places in the tank. The very powerful Tetra internal filter from the kit provides its inhabitants an ideal place to live healthily. 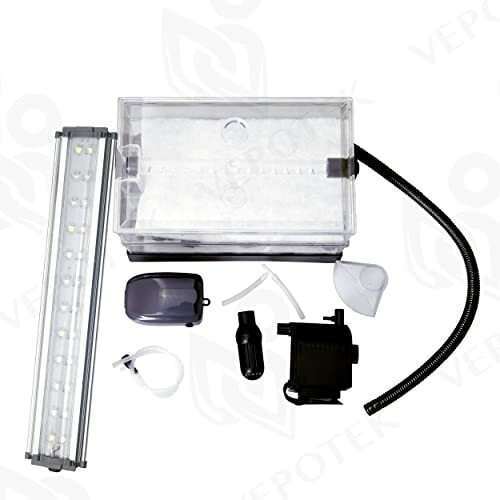 The bright aquarium LED light of the kit provides a good view of the aquarium fish and plants even in the dark. The kit also comes with samples of fish food and water care that you will need to care for your fish. 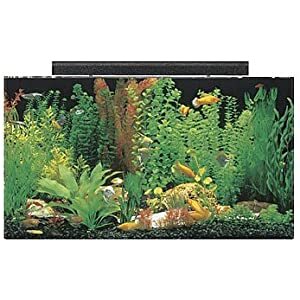 If you only need an aquarium to get started on your first venture in the aquarium hobby and don’t care about what size it is, a 20 gallon aquarium kit will be the best choice. However, if you only love large tanks, I strongly recommend this fish tank. With its very affordable price and beautiful design, it is very easy for you to decide, make and enjoy your sound decision.